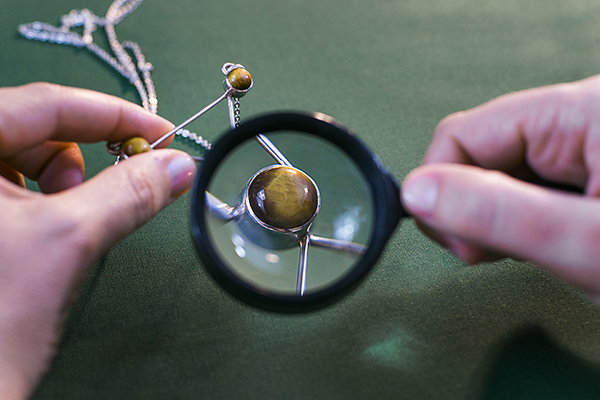 We are opening our Crystal Vault to give you some insight into the gemstones we use! First up is Malachite. The deep green colors in Malachite personify nature and the innate beauty of trees, roots, and plants and symbolize growth. Throughout history Malachite has been used as a protective gemstone, absorbing negative energy from the world and body. Malachite is a green mineral formed by the oxidation of copper, so on a basic level, it’s copper rust. But what a beautiful rust it is. 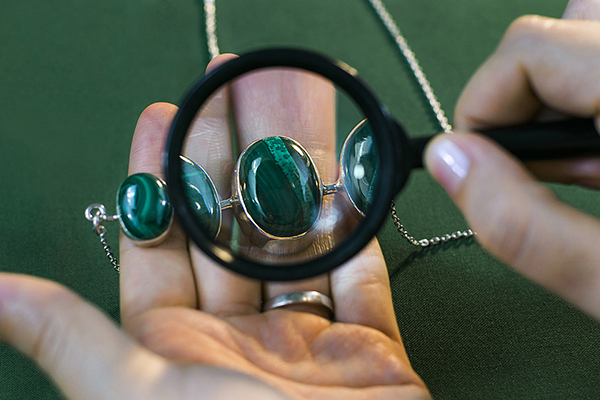 Malachite is used in our Capital Necklace. Looking at a Lapis Lazuli gemstone is like staring into a night sky; you see a beautiful deep blue with a shimmer of pyrite stars. 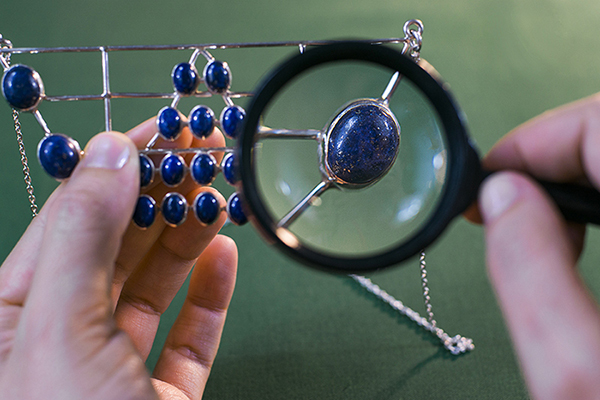 Lapis Lazuli has a rich history – it was one of the first gemstones to have been worked on and worn as jewelry. The Golden Sarcophagus of King Tut is richly inlaid with Lapis Lazuli- the Egyptians valued this blue hued gemstone for its color and contrast to their golden desert hues, and its color was also seen as a supernatural force that would guide one into the depths of knowledge. 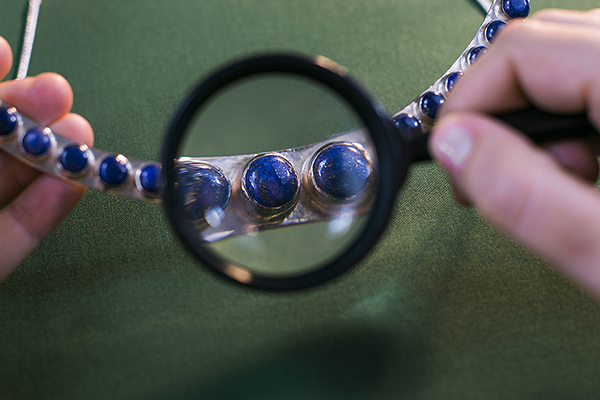 Catherine the Great had an entire room in her palace adorned with Lapis Lazuli – walls, fireplaces, doors, mirrors. Favored by the Old Masters during the Renaissance, the most expensive pigment (ultramarine) was made from ground Lapis Lazuli – when you see a painting of the Madonna in her blue robe, you are seeing the deep blue richness of Lapis Lazuli. Lapis Lazuli is used in our Dynasty and Empire Necklaces. 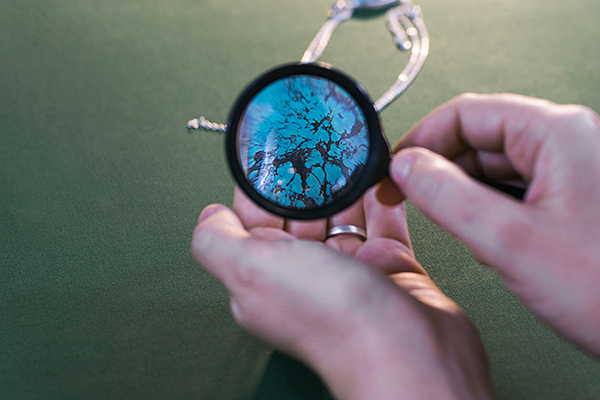 In past and present, Turquoise is seen as a talisman – bringing the wearer good fortune. 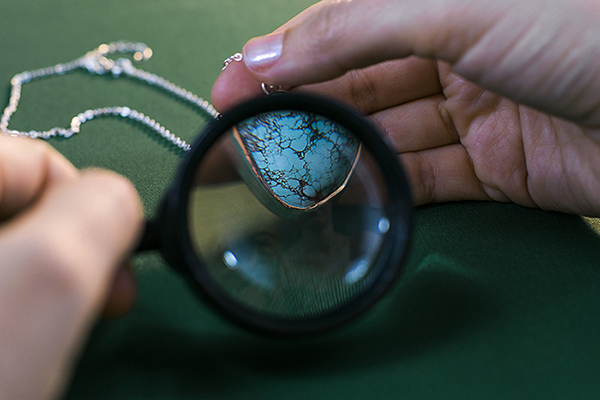 Tibetan Turquoise is mined in the Himalayas, and its distinct marbled matrix reflects the stone in its natural and raw state. This type of Turquoise has been a part of Nepalese culture for thousands of years – the fact that no two Turquoise stones will be alike is of distinct significance, seen as a phenomenon unto itself. In Tibetan culture, the larger the stone the more power it possessed. And similar to Native American folklore, the Tibetan Turquoise is seen as a symbol for the sky. Don’t be fooled by the influx of popularity of the Turquoise in Southwestern fashion – it’s gotten harder to find in its untreated state and the market is rife with knock-offs. Tibetan Turquoise is used in our Artifact Necklace. Powdered Turquoise has many of the same characteristics as Tibetan Turquoise; the Turquoise for this stone has been ground up to achieve a greater mass of the color. 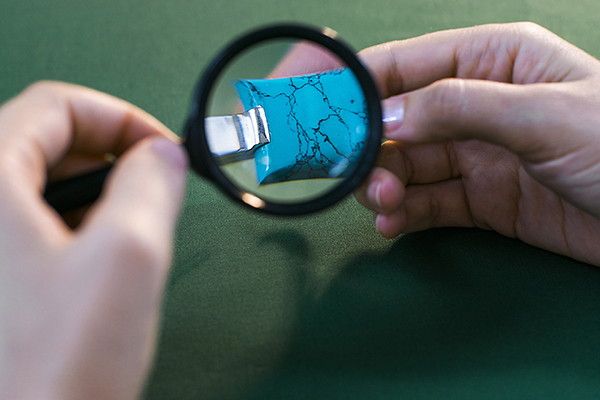 Powdered Turquoise is used in our Emic Bracelet, and Dynasty and Niche Necklaces. A member of the quartz family, Tiger’s Eye is a chatoyant gemstone; you can see the shimmering cat eye effect on this stone when light reflects off of it. Its watchful quality has been known to give you a new perspective and help ground you; Buddhist prayer beads are often made from Tiger’s Eye. In ancient times, the stone was worn by warriors and soldiers to help protect themselves in battle and give them courage. No coincidence then that the ‘Eye of the Tiger’ song was used in the Rocky movies (couldn’t pass up this 80s movie reference!). Tiger’s Eye is used in our Tribute Necklace and Tribute Earrings.